I'm about to pull my hair out. I just dropped a sizable chunk of change on this program only to have trouble doing the thing I need most: import vectors I drew on my iPad (in Autodesk Graphic) into a program that has the Combine Shapes feature. I've been exporting in both SVG and PDF format from Autodesk Graphic, and when I open it in Affinity, it's just a shape. If it's not possible to save paths in one program and open them in another, I'm probably going to put a hole through the nearest wall. PLEASE tell me this is somehow possible. I don't understand what you mean. Shapes are just filled paths. So are you saying that unfilled paths created in another app are being imported into one of (which?) 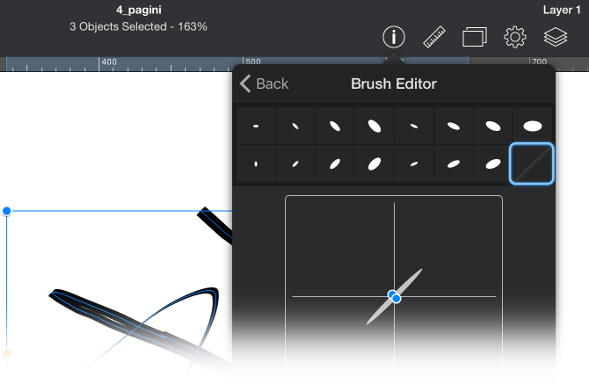 the Affinity apps as filled shapes, or do you mean something else? I've just checked this and both PDF and SVG files are kept as vectors/paths when exported from Graphic and opened in Affinity Photo/Designer both on iPad and desktop versions. How are you exporting the file from Graphic? Can you detail the steps you are taking please? Any chance you can attach the .idraw file you are trying to export so i can check it out as well? I can provide you an upload link if you want to keep it private. See attached files. Sorry in advance if my lingo is off. I'm still on the steep part of the learning curve! In the .idraw file, see how there's a path running down the middle of each line, like a backbone, so you can easily change the shape and pressure curve of the strokes? In the SVG, that path backbone is gone. Each stroke appears to have been outlined with a path instead. If you go into Outline Mode on both, you can see that this is in fact what has happened. I don't want that. I need the backbone. 1) Take multiple different paths, each with their own unique pressure curves. 2) Assemble them into the outline of a shape, joining them together (maybe at their endpoints, maybe not) in a way that doesn't screw up each individual path's pressure curve. 3) Fill the resulting shape with color. 4) Be able to edit the individual paths and each one's pressure curve later. From what I can tell, both Designer and Graphic turn pressure shaped paths to outlines when converting to .svg. I fear what you want to do is not possible. Looks like most of the other export options just rasterize the vector drawing. After a little bit of research, I think I found what I am really needing here. The Width tool in Illustrator does exactly what I needed and cuts out a lot of steps. It allows me to change the line width directly along the path, preserving the paths. that teeny tiny little pressure graph that doesn't even have enough room to add the kind of detail I want to a complicated path, and will get knocked off kilter if I modify the path anyway. It drives me nuts that I've essentially been trying to simulate this tool through workarounds when it already exists. Doing this all the time would drive me insane, especially because connecting those lines to fill them would just mess everything up. I'm also pretty sure a Width tool feature isn't currently anywhere to be found on iPad vector apps, which makes me really sad. The Width tool in Illustrator does exactly what I needed and cuts out a lot of steps. It allows me to change the line width directly along the path, preserving the paths. I am not sure about this so I hope someone will correct me if this is wrong, but I think at least part of the problem is there is no variable width attribute/property defined in the SVG standard; so regardless of the app, any export to SVG format must convert variable width lines to closed, filled shapes. If Affinity Designer or Autodesk Graphic had the Width tool, I wouldn't need to export to SVG at all. 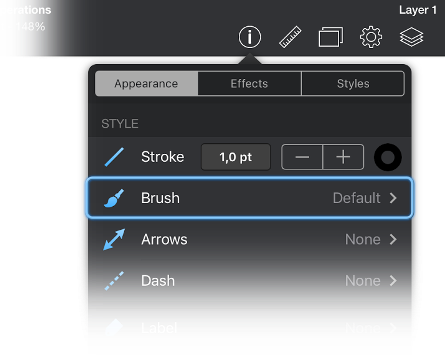 Graphic has to "expand" the brush and pencil strokes when the drawing is exported as PDF or SVG because there is no common inter-app format for brush strokes. There is no workaround for this, I'm sorry, unless the user is OK with getting rid of the variable contour of the brush strokes and have the strokes export as paths, then reapply preset or custom brush contours in Affinity Designer. After getting rid of the brush contour, you need to give some thickness to the path(s). This is done from the same 'Appearance' tab, by increasing the Stroke thickness from 0 by tapping on the [+] button or in the input field. Save the file (with 'Save a Copy') and then export it as PDF or SVG. True, but sometimes files are not available in an application's native file format & an SVG version might be the only one that preserves vector shapes, or allows you to switch back & forth between different vector apps to use some feature one has but the other one does not. For that situation, it would be nice if the apps did some kind of optimization to reduce the number of nodes of the converted shapes to the minimum needed to preserve the original width characteristics. I do not have Autodesk Graphic to test with, but I know that Affinity Designer does not do this, as opening your attached 'Bell - just lines.svg' in AD demonstrates all too well. So, while I agree that a Width tool would be a welcome addition to AD I would love to see implemented, I also hope that eventually we get some better tools or options to simplify paths.